So happy that I was offered to be a part of PopXo’s Blogger Network. Nothing like it .. reallyy! Anyway, they had their Bangalore edition of PopXo Mini Fest earlier this month and I was invited too. So, here is all the highlights on what happened at the event through pictures. Lots of fun indeed met my girls Princy from The Jeromy Diaries and Nandini from Sartorial Secrets. The theme of the party being Beach style hosted in one of my favourite restaurants – Olive Bar & Kitchen. Love this place for all the Mediterranean Vibe it offers. We had some fun events & contests to keep us occupied at the Amazon Fashion, Amante Lingerie and Lakme Salon booths. 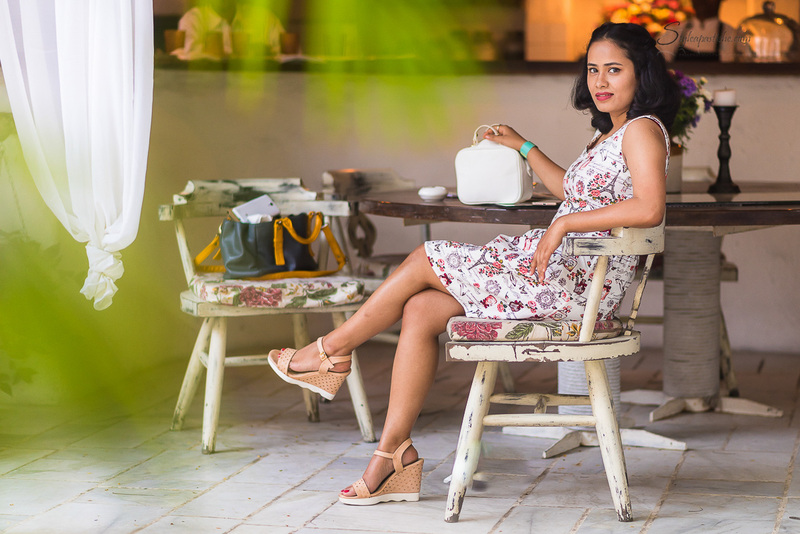 What I wore to the event – this lovely dress in white with prints of roses, perfume bottle and Eiffel Tower, I bought from my recent shopping haul in Kuala Lumpur, Malaysia. Love the feel of this 50s’ inspired pleated frock with a fitted waist and wide V-neckline. Perfect for my pear shaped body and my style sensibilities, simple yet fun and elegant. Adding a bit of colour is light rose red coloured wedges with a sporty sole and cut out details. The white bag from Zara completes the look topped with a scarlet matte lip and wavy undone hair. Loved that dress, it looked so pretty on you 🙂 let’s catch up soon!